Norwegian pianist Jan Gunnar Hoff has had the honor of being the first artist on Losen Records to release an album recorded at producer and label owner Odd Gjelsnes' studio Berxeta, in sunny Spain. It was fitting that the name of that album was called Berxeta (Losen Records, 2012), and its sound was influenced by the surroundings: a warm and eclectic brand of fusion with influence from bouncing Latin rhythms. However, Gunnar Hoff has never shunned his Nordic sensibility and Fly North! finds him returning to his Scandinavian heritage with a stellar cast of musicians. With names like Norwegian trumpeter Arve Henriksen, Swedish bassist Anders Jormin and Danish percussion wizard Marilyn Mazur, it's nothing less than a Nordic super group and fortunately they are able to deliver on Hoff's promise. Paradoxically, they do so by setting themselves aside and being servants to the music. All compositions are written by Hoff and a good portion of them, including the title track, can be found on his solo release Living (2L, 2013). The music is epic in its proportions and the natural beauty of Henriksen's wordless voice and airy trumpet playing is a wonder to behold on the title track. Hoff is a master stylist whose soft keyboard shadings, abstract improvisations and deep lyricism imbue the compositions with many different moods, while Jormin and Mazur both add to the atmosphere like painters rather than an ordinary rhythm section. Together these four master musicians travel deep into a land of beauty. Fly North! is an enchanting musical journey in first class all the way through. Track Listing: Fly North; Living; Arise; Places; Sacrifice; Böcklin; Spheres; Valse de Décembre; Questions; Gathering. 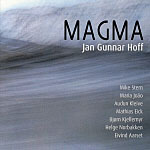 Personnel: Jan Gunnar Hoff: piano, keyboards; Arve Henriksen: trumpet, vocal; Anders Jormin: bass; Marilyn Mazur: drums, percussion. Jan Gunnar Hoff CD/LP/Track Review Jakob Baekgaard Losen Records Norway Oslo Arve Henriksen Anders Jormin Marilyn Mazur Fly North!